The tackle used to catch them. Alby asked if I could do a small tackle write up to help younger members and members who had not yet been out in search for Grayling, on this occasion I’m going to concentrate on bait fishing as fly fishing for Grayling is no different to fishing for Trout except in some of the patterns used. There are many Centre Pin reels on the market today most of them costing a small fortune to buy but there is nothing to stop you going along to car boot sales, local auctions or 2nd hand shops and having a look around, you may surprise yourself in what you find, most of these reels came from those sources and the dearest cost me just over £50. 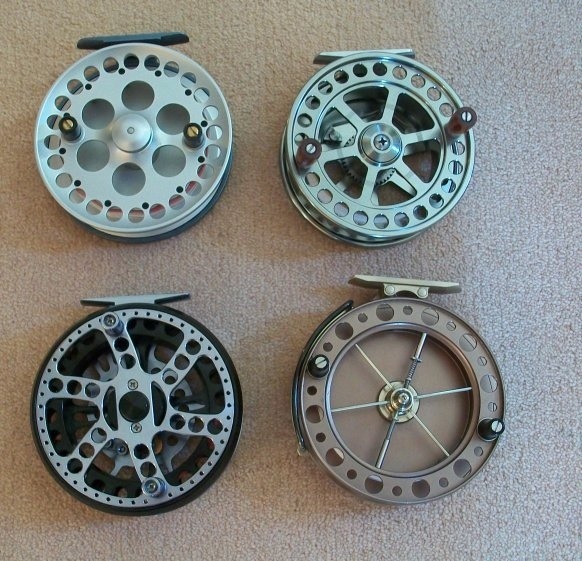 These reels are what are known as true pins and most of them pictured are over 50 years old and still spinning & catching fish today as they were intended for all those years ago, As I said these are known as true Pins reason being they run on a centre pin which comes through the spool and the spool revolves around the pin unlike the new pins of today where they still have a centre pin but they now run on a set of bearings housed in the spool itself. These reels are the modern day equivalent to the reels above and in most cases cost in the hundreds of pounds, They run on a set of bearings housed within the spool itself however there are some exceptions price wise. 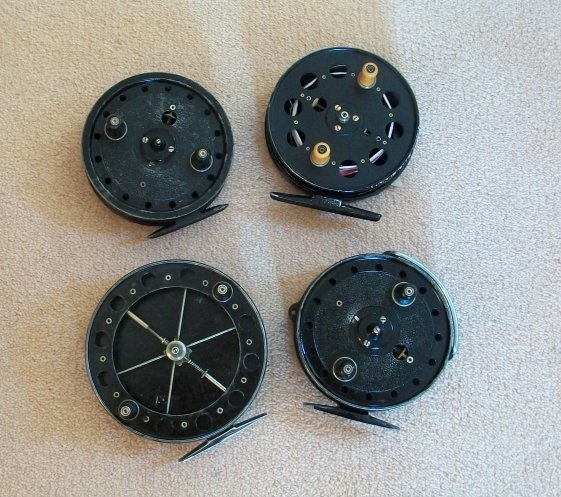 The reel on the top right of the picture cost £30 and the reel on the bottom left cost £90 and they run not as good but not far off as the other two pictured which cost a few hundred pounds each. So when you see Centrepins advertised believe me you don’t have to buy top of the range to get started a £30 reel would suffice and I still use them just as much as the more expensive reels. 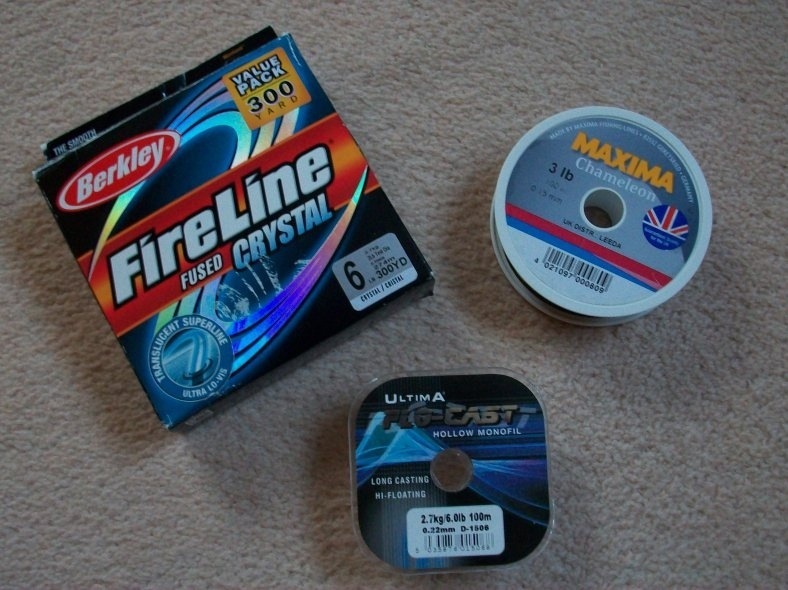 Dont let anyone tell you that you cannot use fixed spool reels for trotting for Grayling as they are telling you lies, you can, there is nothing to stop you using these reels and in some conditions they are better than the Centre Pin reels shown above. 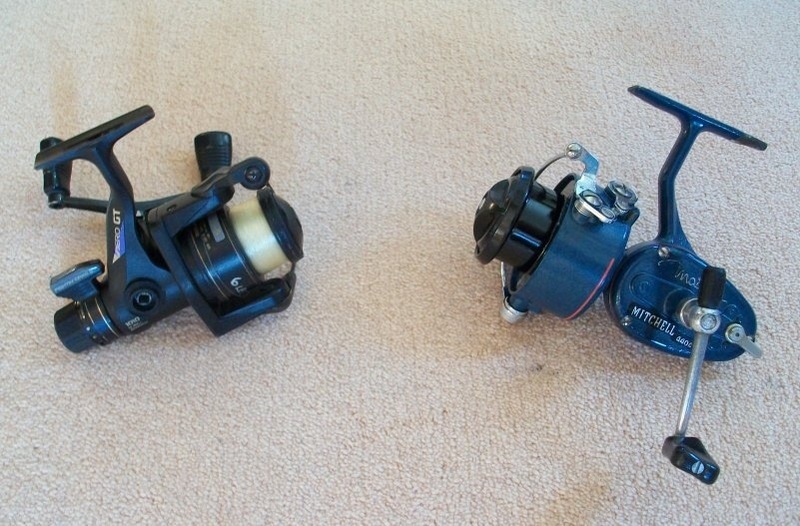 Again these dont have to be Brand new modern reels either, as you can see from the picture I use old & new for my fishing. When trotting for any fish with a fixed spool reel you must control the speed that the line peels off the front of the spool either by using your finger or if your not as confident by passing the line through your other hand that way you are in control of the line and if a fish takes you can strike straight away without having to re engage the arm of the reel. This is down to own preferences as over my years of fishing Ive seen & used all sorts of rods in my quest for the Grayling with a float, Growing up whilst out fly fishing, Ive simply taken the tippet off and spooled on 20metres of line and attached a float so effectively fishing with a fly reel and rod with float tackle, Ive also taken the fly reel off and replaced it with a spinning reel and used my fly rod. 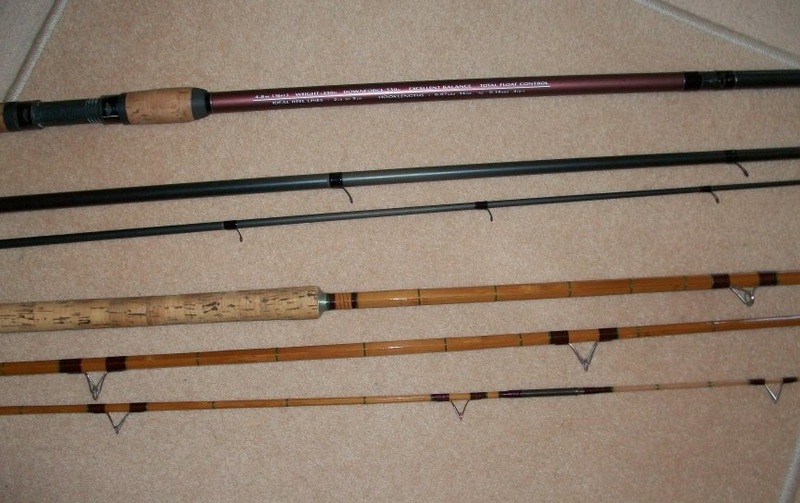 Mostly today I use Cane Rods through my own choice as I get great pleasure from using old kit but I still have modern day carbon rods which gets an airing from time to time. 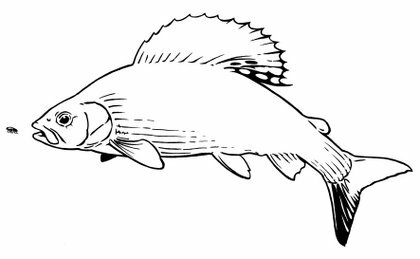 Any modern day float rod around the 11ft mark will suffice, but the longer the rod you have the greater the control over the float but the downside of this is if your fishing the Avon there are lots of trees around to get the rod tip caught in….Your own preference. 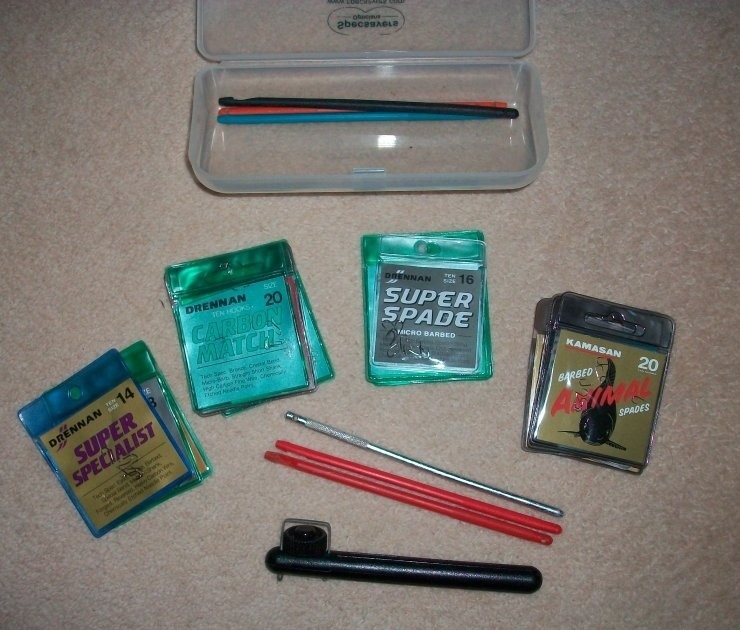 Most of us grew up knowing no different and only using what we were shown to use by the people who taught us to fish and most of the floats used in those days were Grayling Bobbers as shown below, we all had them and they worked but have their downsides, They take lots of weight which is great if you want to get the bait down quick but when retreiveing the line after a trot down they leave a wake the Titanic would be proud of and if using a centre pin you will most certainly go home after the session knowing you have been using a bobber float all day. 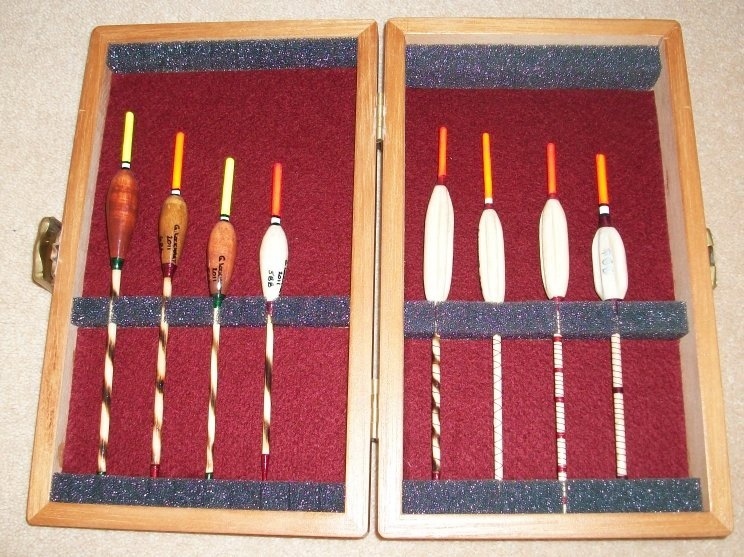 Below is a display of floats more suited to Grayling trotting, but there are more float patterns also made from all sorts of materials from Elderpith, to Balsa through to cork with wire stems, bamboo stems the list is endless, they are slimline in comparison to the Bobber therefore causing less resistance in the water when retrieving and will come back upstream quicker and smoother than the bobber, leaving less of a disturbance and with no aching arms. 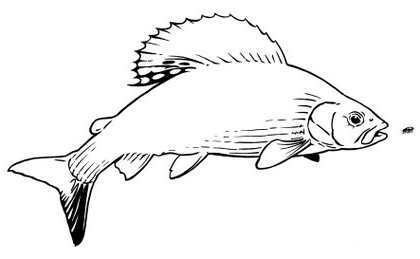 They can be various sizes to cope for varying depths of river and weight patterns. Monofilament such as Maxima will suffice if your not intending to spend lots of money on tackle, if your more advanced and want better line control and float control then I would recommend buying a line purposely designed for float fishing which floats on the surface of the water such as Ultima Flocast or like me I prefer to use a braided line as all lines have a stretch where braid does not you are in direct contact with the fish using braid. Its no good using a line which far outweighs the size of fish in the river, a 4lbs mainline will suffice the River Avon or Clyde with a 2lbs Hook Length as Grayling which are known to come right up to your feet and feed around your feet when trotting for them will still shy away from a hook if tied on a heavier line, they haven’t survived all this time through stupidity. 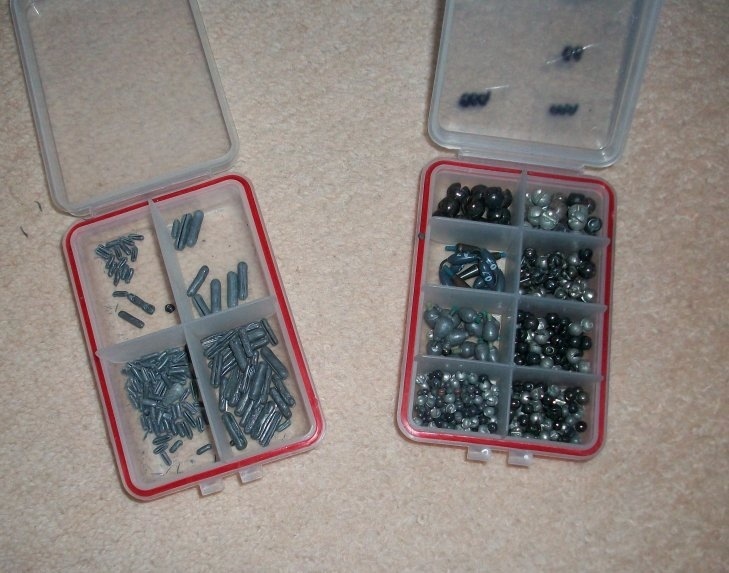 Any normal split shot will do, here I have 2 boxes which I have transferred into my own boxes for ease of use, the one on the right is the modern split shot which you can buy in any tackle shop and the one on the left is style weights used in conjunction with match fishing using a roach pole, I prefer to use these as they are more streamline once attached to my line, again my own personal preference. Everyone has their own preferences when it comes to hooks, I personally dont like eyed hooks I favour the spade end hooks as I feel it gives better presentation of the bait, but use whatever hooks you are most comfortable with, again size matters, the bigger the hook the more it is showing to the fish and the less likely it will take your bait. 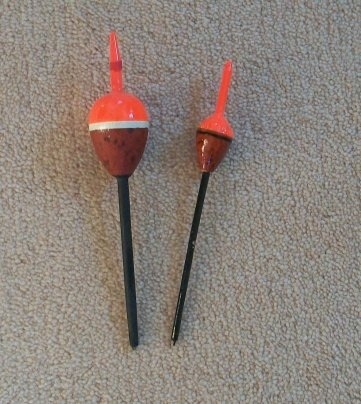 I carry a few packets of most common sizes from size 20 down to size 14, mainly micro barbed, that way the hooks are easy to get out & not leaving any damage to the fishes mouth like a normal barbed hook would and I always carry a disgorger as you can see I have a tendency to loose them so have a few which all fit neatly into an old specsavers case and it fits in my jacket pocket. 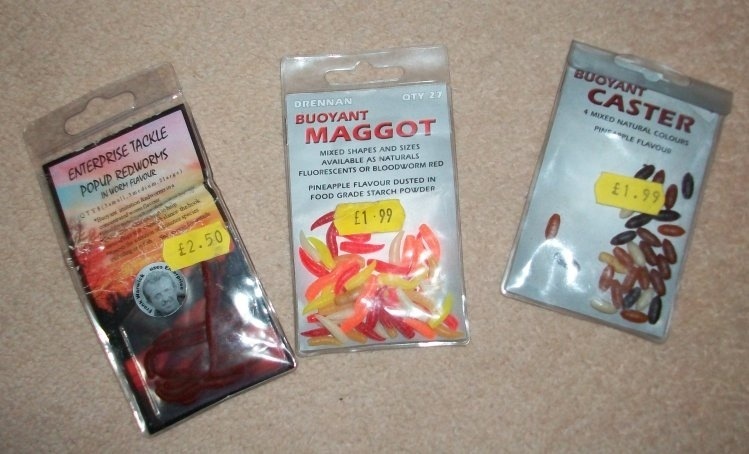 Dont be scared to use artificial baits, all these baits shown below work effectively when trotting for Grayling and can stop nuisance fish such as minnows from pinching the bait from your hook. They are cheap but very effective, don’t pass them buy. I hope this small write up has made things a little clearer for you if you didnt previously know anything about the tackle used for Trotting for Grayling, as I have said in the write up you do not need to go out and spend hundreds of pounds on tackle to get yourself out on the river bank on a crisp frosty morning and enjoy not only the natural beauty of your surroundings but the sheer delight of the lady of the stream the Grayling. 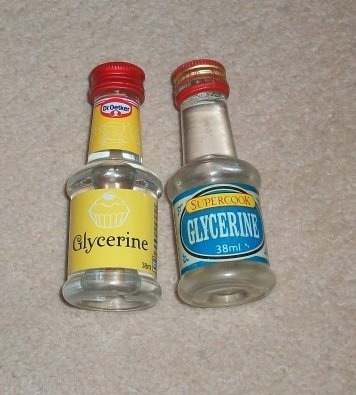 Which brings me to my final top tip Glycerine get yourself down to your local supermarket and get into the cake making Aisle and dig out a bottle of Glycerine, it only costs about a pound but this stuff will keep you fishing in minus temperatures, when your rod rings start freezing up and your line starts to freeze to your rod eyes, dip some glycerine onto them and this will dissolve the ice and allow you to continue fishing. 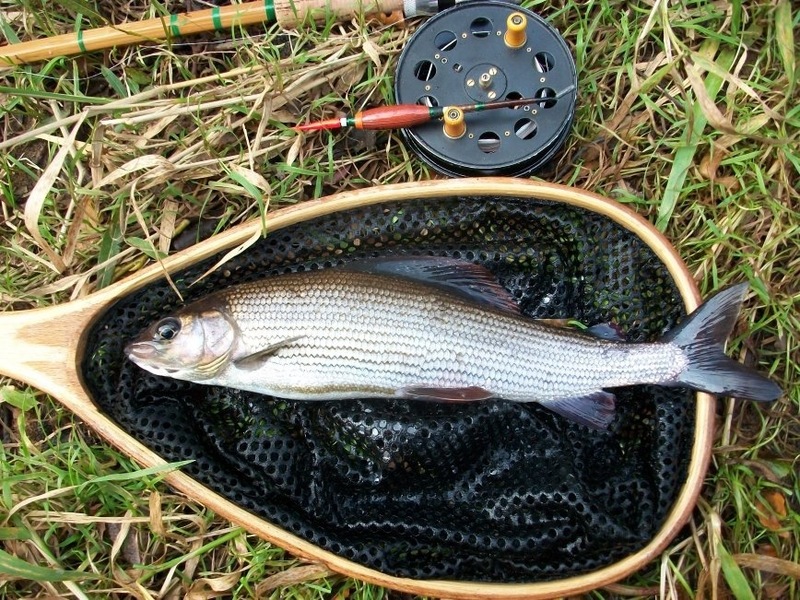 Well known Grayling Angler & Float Maker – George Lockhart – George has a great Blog – check out Traditional Handmade Floats. See also link to George’s Website. George thanks very much for providing this article – ” Grayling Tackle Hints”.